After Upgrading Android Version from Lollipop 5.1.1 to Marshmallow 6.0.1 so many people having issues. Like Restarting, Booting again and again, System Ul has stopped working, Hanging or any other issues related to Latest Android 6.0.1 Marshmallow. So many people wanted to Upgrade their Samsung Galaxy J500H, J500F, J500G device to Marshmallow 6.0.1. But they don’t know about the circumstances they could suffer from. Well, If you are the one from those suffering users. Don’t worry about anything we are here to help you out from this problem. 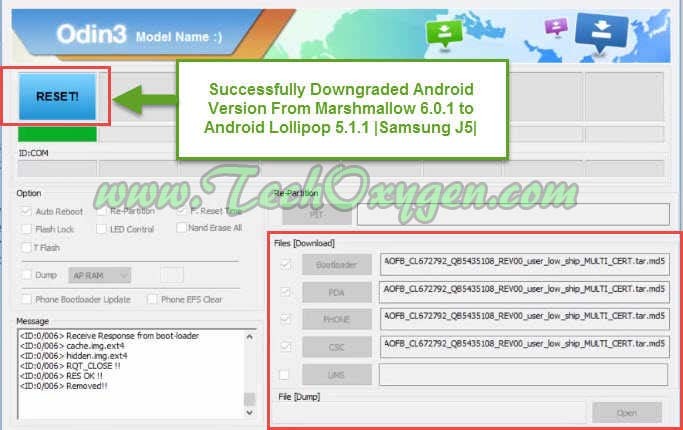 We will help you to Downgrade Android Version Marshmallow to Android Lollipop 5.1.1, Going to show you Step by Step guide so that you can easily understand and apply these steps on your Samsung J5 Phone to go back to the Android 5.1.1 from 6.0.1. Before you going to demote from Marshmallow to Lollipop, Make sure to create a full backup of all your important contacts and other useful data. First of all, Download these Software and Files so that we can use them to Decrease Android Version 6.0 to 5.1.1 In our Galaxy J5 Phone. Secondly we will Flash Galaxy J500H with Full ROM using 4 FILES in Samsung Odin Software. 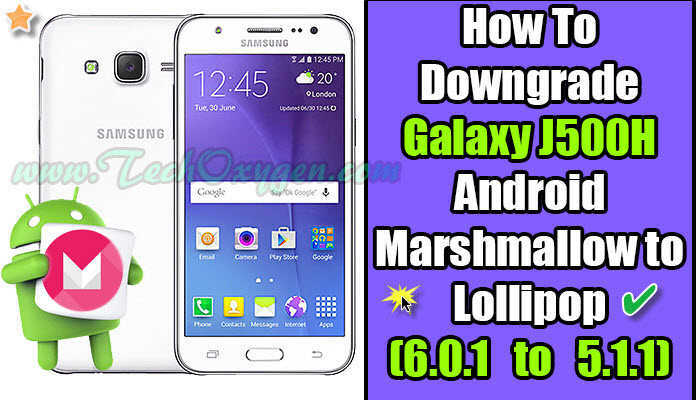 Follow these Step by Step tutorial to completely Decline or Lower Android Version Marshmallow 6 to Lollipop 5.1.1 on Samsung J5. Step 1. To do Combination ROM Flash process, we need to put “Samsung J5 in to Download Mode”. So, Power Off your Phone and press “Volume Down + Home KEY + Power Button” at the same time. Keep pressing for about 5 to 7 seconds. When you see “WARNING Screen” Press “Volume UP” button to Continue and then you’ll be on a Downloading MODE. Step 2. Install Samsung Odin in to Computer then Connect J5 device to your computer using USB data cable. Extract COMBINATION_OXE_FA51_J500HXXU1APA2 file to Desktop of your computer. Step 3. 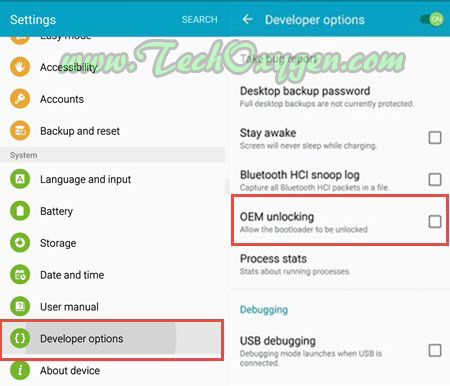 Open Samsung Odin and click on “PDA” then browse the “COMBINATION_OXE..” file and open it into Odin and Check on “Auto Reboot” and “F.Reset Time” then click START. 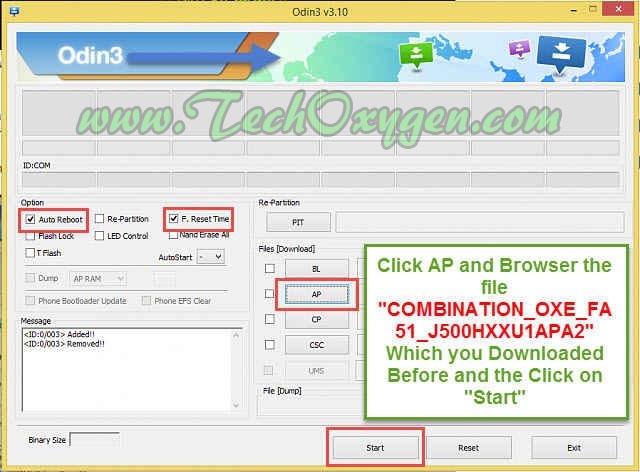 This is how you can Flash your device with the Combination Firmware using Odin. It will take 5-8 minutes, So wait until the process done. Once this done go to “Settings” of your Phone tap on “About Device” then Scroll down and tap 5 to 6 times on “Build Number” to enable the “Developer Options”. Then go back and tap on “Developer Options” then tap on “OEM Unlocking” and Enable it. And RESTART your phone. Step 4. After restarting make sure your Phone is in “Downloading Mode” then go back to the PC and open Odin. Now we need to Flash Samsung J5 again with a Full Firmware (Galaxy-J5-J500H-Full-Factory-Rom-5.1.1) using 4 Files which you downloaded before. Step 5. Extract “Galaxy-J5-J500H-Full-Factory-Rom-5.1.1” on your desktop and go to Odin. Click on “BootLoader” and open “BL_J500H…” File. Click on “PDA” and open “AP_J500H…” File, then Click on “PHONE” on Odin and Open “CP_J500HXX..” File at the last Click on “CSC” and open “CSC_OXE_..” File. Step 6. Once all 4 Files Submitted to the Odin3 Software. Make sure you’ve Checked on “Auto Reboot” and “F.Reset Time” at Odin then click Start. It will take 5-10 minutes to complete the whole operation so wait until this done. You’ll see “RESET!” with blue color on the Odin3 Software. It means you have successfully downgraded to Android version lollipop 5.1.1 from Marshmallow 6.0.1. Samsung J500H phone will be restarted it will take some time to reset the device completely. Just after that you can do Initial Setup of your phone and start using your phone with Android 5.1.1 Lollipop version without any issues or problems. So, That is a complete Guide, Method to Lower, Downgrade Samsung Galaxy J5 to Android Lollipop From Marshmallow 6.0.1. If you need any help feel free to ask me in the comment. 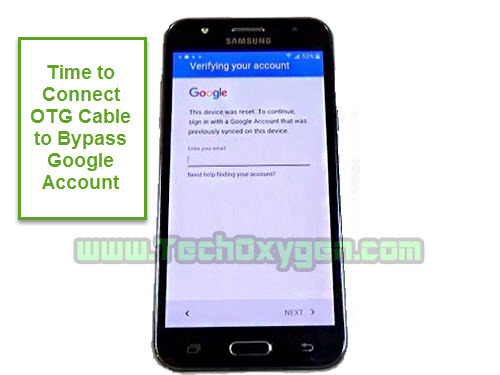 We published an article couple of months ago about the Bypass Gmail ID Verification for Samsung Galaxy J500F/00H by using OTG Cable. So, today we are going to share with you an other article for the people who can not use OTG Cable or they don’t have one. 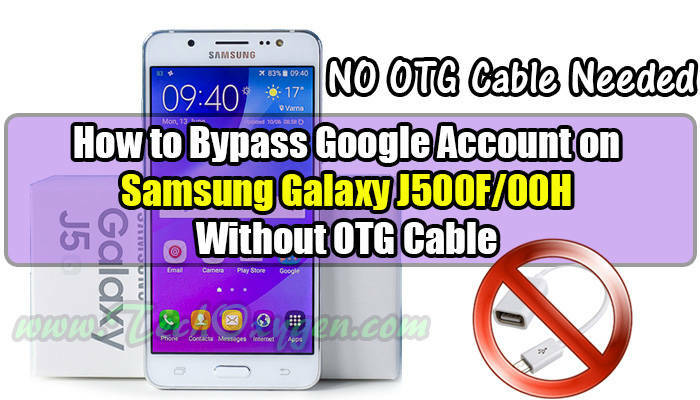 Therefore if you are having troubles regarding OTG cable method, Fortunately there is a new tutorial which will help you to Bypass Google Account without OTG Cable in Samsung J500F/00H. 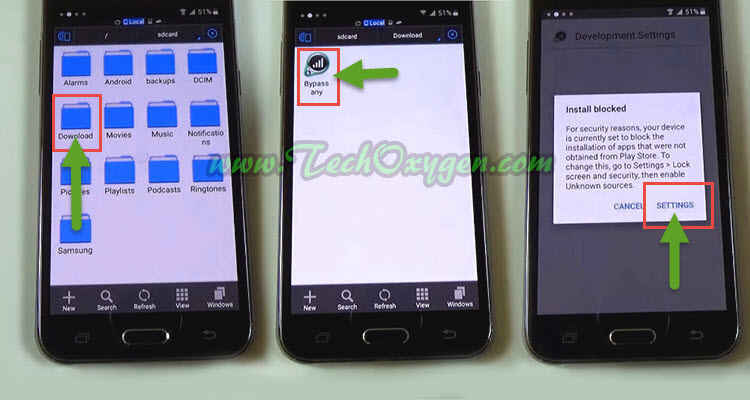 You simply don’t need to use any OTG Cable for this method, you can easily remove the Google Verification Account from ‘Samsung Galaxy J5’ phone. The Google ID Locked Protection is called FRP (Factory Reset Protection) and is a bit different from “Samsung Reactivation Lock”. Fortunately this SideSync guide is 100% Free and works without OTG Cable. Step 1. Restart your Phone, Select Home Language > Connect to the WiFi Network > Agree to the Terms and Conditions. Step 3. Once you get the “Google Account Verification” screen. 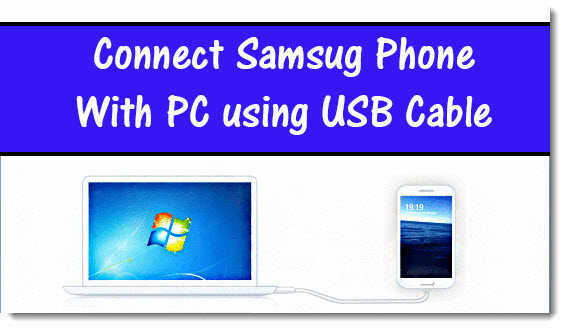 Connect your Phone to the PC by using USB data Cable make sure to open the SideSync Software in the PC. Step 4. Just after connected you’ll see “Google Chrome” on your phone screen, Tap on it and now you’ll have access to the Internet on your phone. Now you can remove USB Data cable from the phone. Step 5. 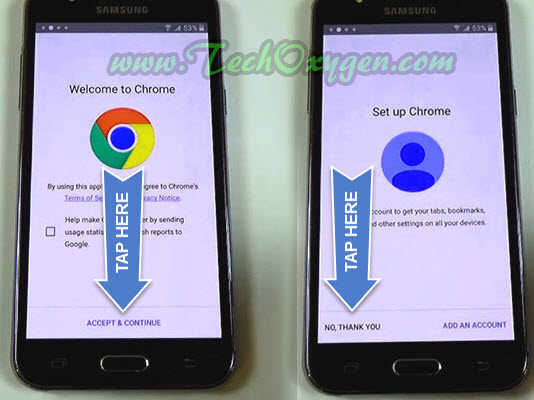 You’ll be at the Chrome Browser, Tap on Accept & Continue > NO Thank You Tap on the Search bar and Type Bypass application download link: https://goo.gl/7uGVMn and search for it. Step 6. On Onedrive page, Download “Bypass Any Samsung Device.apk” and after downloaded < Go Back and then you’ll see “Terms and Conditions” page tap on AGREE. Step 7. After that You’ll be redirected to the Samsung Store on the page of “SideSync (Samsung Electronics Co,Ltd.)”. Here you don’t need to install this application, Tap on “SEARCH” at the top right corner of the screen and Type “ES File Explorer” and download the First Result application. Step 8. Then you have to Sing IN with a Samsung Account. So, If you have registered before so tap on SIGN IN and enter your Email ID and Password. If you don’t have Samsung Account, tap on “Create Account” to create one and “Sign IN” with it. Step 9. After Signing IN with Samsung Account, You’ll redirected to “ES File Explorer” Page. Tap on ACCEPT AND DOWNLOAD. 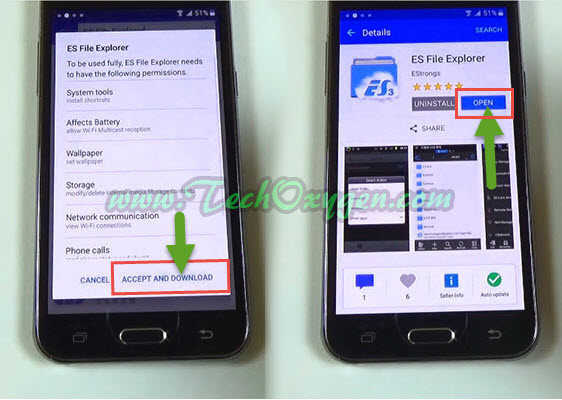 Once the Download done open the ES File Explorer and go to the “Download” folder, Open the “Bypass Any Samsung” Application. Tap on Settings > Scroll down and enable the “Unknown Sources” > INSTALL. Step 10. Once the Application installed, Open it and then you’ll have the access to your Phones Settings. Scroll down tap “Backup and Reset” > “Factory Data Reset” > RESET DEVICE > at the last ERASE EVERYTHING and your phone will restart. Congrats! Now you can complete the initial setup and will not face FRP lock or Google Account lock on your Samsung Galaxy J5 phone. 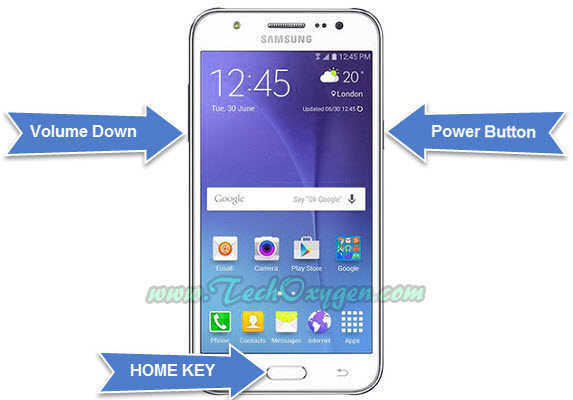 Once your phone restarted, Complete the initial setup of the Samsung J500F device. And you will notice there will be no Google Account Verification locked screen anymore. Through this guide, I hope you have completely disable the Google Account if you still need any help feel free to comment below. What if you Forget your Gmail Account and you can’t get in to your device? 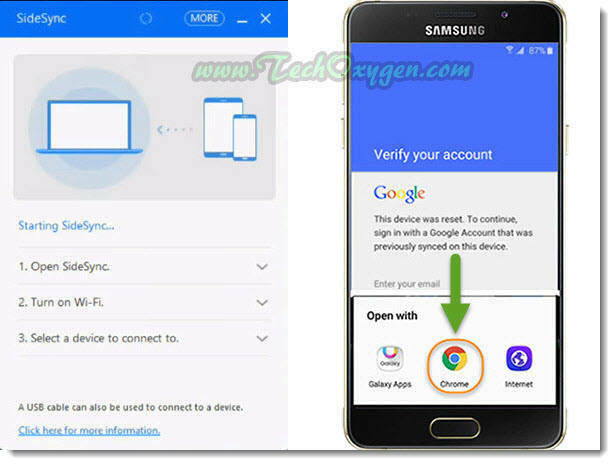 Here we can do a bypass google account on any android phone this guide is for How To Bypass Google Account Gmail Android Lollipop 5.1.1 On Samsung Galaxy J5 J500F (OTG Cable Method). But you can use this method for any Samsung Device. 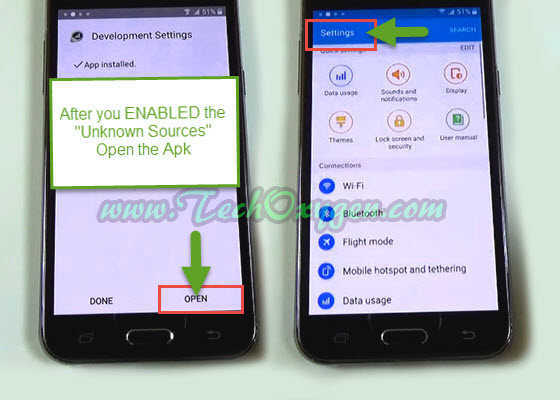 So, In this article I’ll tell you how to Bypass Google Account on Samsung Galaxy J500F its very easy to bypass Google Account on this device just follow these simple steps which I’ll teach you in this guide. 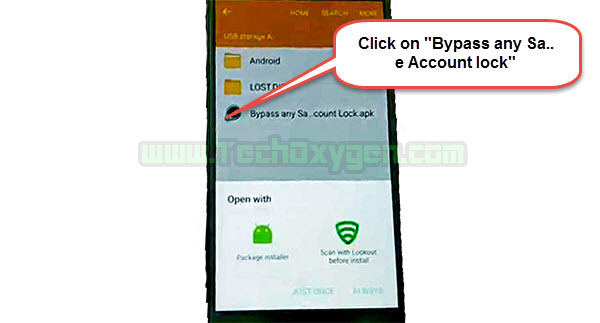 You can use this method, to remove the Factory Data reset protection FRP, in case you forget your own password of your Google account or you forget the lock pattern of your mobile. 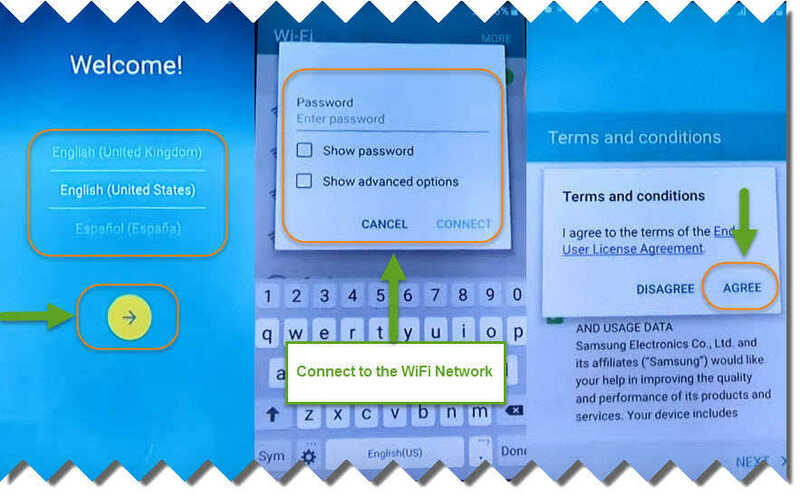 You need a WiFi connection- OTG cable and a USB data stick & the application that you must unzip and copy on your USB data device. 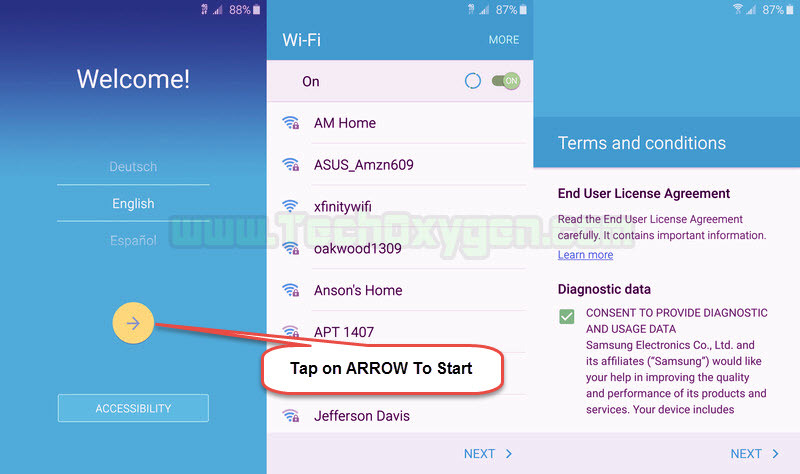 Step 1: So let’s begin the operation- Tap on the “Arrow >” on the screen to start then you must connect a Wi-Fi network when you connected then tap on NEXT >, NEXT > then tap AGREE > wait a few seconds. And now you’ll see this message : “This Device was reset. To continue sign in with a Google Account that was previously synced on this device (Samsung Galaxy J500 or J500H). Step 2: Here you can’t tap on NEXT > because you’ve to enter the Google Account Email for this step. If somehow you forgot the email or Google Account so here we do a bypass with OTG Cable method. Download the application and save it in your USB Device then connect the USB Device with your OTG Cable and connect your OTG Cable to your mobile phone. Step 4: Then you’ll see “USB STORAGE A” on your mobile screen then tap on “Bypass any Account Lock” Folder which is the application you saved in your USB Device Tap on > “Bypass any Samsung Device” then It’ll show “INSTALL BLOCKED” click on SETTINGS> on the second last you’ll see “Unknown Sources” tab on it tap OK> and tap on INSTALL. Step 5: When the application is installed tap on OPEN> now you have access the settings of your phone just scroll down and go to BACKUP and Reset> Factory DATA RESET> RESET DEVICE> And tap on ERASE EVERYTHING>. Now you must wait until the phone will restart you can disconnect your OTG Cable and just wait for the phone to install initial updates and resetting your device. Then you will see the phone back to its factory data settings from here you can setup your phone as the new. So, This guide is very helpful for resetting your device to factory settings and it will also remove the passwords and Gmail Account from your device so that you can put your own new Gmail Account. 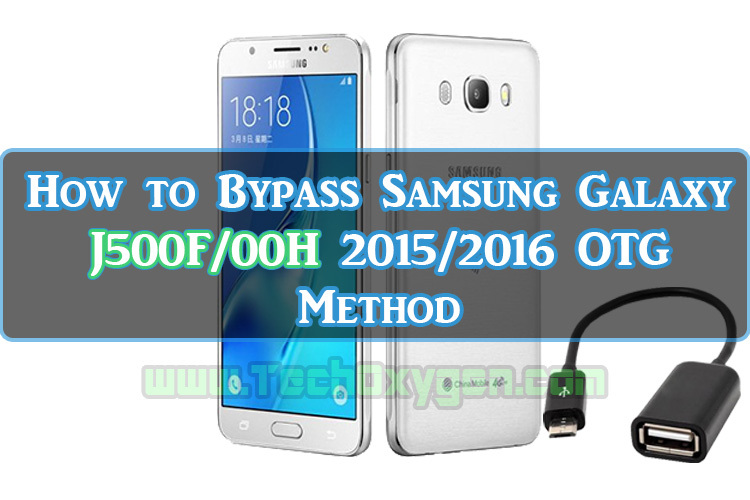 I hope this guide helpful for you to How To Bypass Google Account Gmail Android Lollipop 5.1.1 On Samsung Galaxy J5 J500F 2015/2016 (OTG Cable Method). If you need any other help related this issue feel free to ask me in the comment below.